In Let's Catch, play catch with friends in multi-player party games! Choose from six different single and multi-player modes such as Speed Catch, which tests your ability to catch a fast ball, and Bomb Catch, an elimination party game for up to four players. 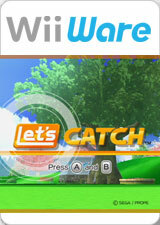 Select from a variety of characters or use your Mii to play other favorite catch games. The graph below charts the compatibility with Let's Catch since Dolphin's 2.0 release, listing revisions only where a compatibility change occurred. This page was last edited on 15 January 2018, at 02:28.